"Emotions. Love, pride, hate, fear. Have you no emotions, sir?" CUTLER: That's the most fantastic story I've ever heard! DOCTOR: I can only repeat, sir, what I have already told you. You will get visitors from that other planet. Disguised in the guards exterior clothing the visitors enter the base, shooting a guard that defies them with the dish like weapon usually carried beneath their chest unit. Cutler protests that they need to retrieve the astronauts in the Zeus 4 capsule. KRAIL: They will not return. KRAIL: It is unimportant now. KRAIL: There is really no point. They could never reach Earth now. KRAIL: I do not understand you. There are people dying all over your world yet you do not care about them. KRAIL: You will be wondering what has happened. Your astronomers must have just discovered a new planet. Is that not so? KRAIL: That is where we come from. It is called Mondas. KRAIL: We are called Cybermen. KRAIL: Yes, Cybermen. We were exactly like you once but our cybernetic scientists realised that our race was getting weak. POLLY: But that means you're not like us. You're robots! KRAIL: Our brains are just like yours except that certain weaknesses have been removed. KRAIL: There would be no need. We do not feel pain. General Cutler sounds an alarm but is rendered unconscious by the Cybermen. Ben tries to attack one with the fallen guard's machine gun but the Cyberman twist it out of shape. KRAIL: It is quite useless to resist us. We are stronger and more efficient than your Earth people. We must be obeyed. 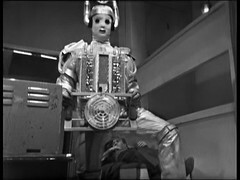 Ben is confined, with the Cybermen using the base's cinema projection room as a temporary cell. Attempts to rescue the Zeus 4 fail and the capsule explodes. 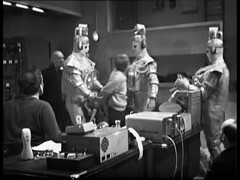 The Cybermen begin cataloguing the base personnel for their transportation to Mondas where they will become Cybermen. KRAIL: You must come and live with us. POLLY: But we cannot live with you. You're, you're different. You've got no feelings. KRAIL: Feelings? I do not understand that word. DOCTOR: Emotions. Love, pride, hate, fear. Have you no emotions, sir? KRAIL: Come to Mondas and you will have no need of emotions. You will become like us. POLLY: Like you? KRAIL: We have freedom from disease, protection against heat and cold, true mastery. Do you prefer to die in misery? POLLY: But look, surely it's possible for us not to lose Earth's energy? POLLY: Then you don't mind if we all die. KRAIL: Why should we mind? POLLY: Because millions and millions of people are going to suffer and die horribly! KRAIL: We shall not be affected. POLLY: Don't you think of anything except yourselves? KRAIL: We are equipped to survive. We are only interested in survival. Anything else is of no importance. Your deaths will not affect us. POLLY: But I can't make you understand, you're condemning us all to die. Have you no heart? KRAIL: No, that is one of the weaknesses that we have removed. Ben uses the projector to blind one of the Cybermen, steals it's gun and kills it. 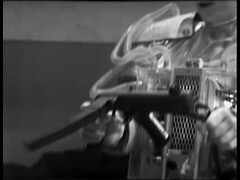 He sneaks into the control room and passes the gun to a recovering Cutler who uses it to slay the remaining two Cybermen. Regaining contact with International Space Command in Geneva they discover a second rocket had been launched to help recover Zeus 4. The pilot is Cutler's son and they must now guide this rocket back to Earth. Cutler attempts to secure the base against further incursion. The base's radar systems pick up a large number of ships: a fleet of Cybermen spacecraft is on it's way to invade Earth. For me this episode is all about the Cybermen. I think they're fabulous here. These aren't creatures from some strange alien world, these are humans from Earth's twin who have undergone a terrifying conversion process from flesh and blood to metal and plastic. KRAIL: We were exactly like you once but our cybernetic scientists realised that our race was getting weak. These aren't creatures looking to destroy us either: they want to turn us into them! KRAIL: Come to Mondas and you will have no need of emotions. You will become like us. 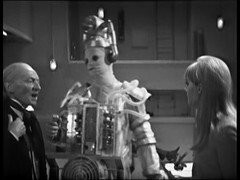 Many years later the Doctor's line from that exchange is used during the story Earthshock to illustrate the First Doctor's encounter with the Cybermen. Right from the start you know the Cybermen mean business, from the shot of the bodies lying half buried in the snow through to instantly killing the guard, viscously overpowering Cutler and bending the gun like it was rubber. They tower over every other member of the cast, there's a lovely bit as Krail walks past the significantly shorter Doctor & Polly. 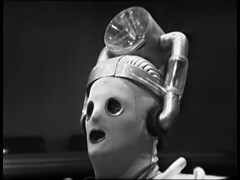 I think the costumes look great but even during this second week they're not holding up well with Krail's ear handles being held onto his head by clearly visible cellotape and one of the other Cyberman's tubes are flopping around disconnected. In fact it's been some time since they were last used, not just a week. 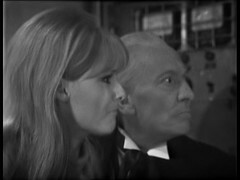 Filming of the snow scenes, at Ealing, took place on August 30th 1966 while this episode was recorded at Riverside Studios in Hammersmith on September 24th, nearly a month later! In addition to the damage incurred between the two filming slots every so often, thanks to the marvels of cleaned up video, you get a shot where you can see the eyes of the actor playing the Cyberman through the mask. Although some might argue this adds to the mystique indicating something is inside the suit I think it slightly detracts from the overall replaced human body appearance. It's little wonder a make over was ordered ahead of their next appearance. And the voices.... lots of people, my wife included, hate the original Cybermen voices but to me they sound like the Cybermen have recordings of words being spoken and their speech takes each of the individual words and sticks them together forming a disjointed pattern of speech. For something similar listen to the attempts to plug the sound fault on Abominable Snowmen part 2. Co-Writer Kit Pedler's day job was working at the Department of Ophthalmology (anatomy, physiology and diseases of the eye) at the University of London. One of the things he had become interested in was the replacement of human limbs and organs with artificial ones: Cybernetics. Looking to replace the Star Monks in his new Doctor Who story he drew on this to create a race that had taken the idea of Cybernetics as far as it could go and replaced the whole body with mechanical parts. Thus the idea of the Cybermen was born. The Cybermen were just what Doctor who was looking for: a successful monster to go alongside the Daleks. The indications are that the BBC new they had a hit on their hands very quickly: Tenth Planet aired 8th-29th October 1966 and on the 18th November a sequel was requested. It's a good job the Cybermen were a success. Terry Nation was attempting to launch the Daleks in their own TV series. The BBC had been offered the series, on 1st November 1966, but rejected it on the 22nd November which then led to Nation trying to sell the series in the USA and the subsequent withdrawal of the Daleks from Doctor Who. BARCLAY: All right. Come in, Geneva. WIGNER: Snowcap. What's going on? We received an emergency from you on the microlink. BARCLAY: (stammering) It was a fault. We're ... We were looking at it now. I'm sorry about the false alarm. WIGNER: Where is this static coming from? We can hardly hear you, even on these bands. BARCLAY: It... It... It... well, I think it must have been the reactor. We had the moderator rods out for a time this afternoon and er, well, well that's probably it. WIGNER: I see. Contact us if you have any further reports on this new planet. We'll being seeing a bit more of some rods from that reactor later! As you can see above the Cybermen in this story are named and although the names are not used on screen the actors playing the Cybermen are credited by those names on the end titles. The Cyberleader, even though he's not called that in the script, is Krail, played by Reg Whitehead. He will play Cyberman Jarl in a later episode of this story and then as a Cyberman in their next two stories, The Moonbase and The Tomb of the Cybermen, before playing a Yeti in The Abominable Snowmen. The online script I'm working from indicates the Cyberman guarding the prone Cutler, and not making a terribly good job of it, is Talon played by Harry Brooks. He's Cyberleader Krang in the final episode of the story. This isn't his first brush with science fiction as he plays various soldiers in Quatermass II. 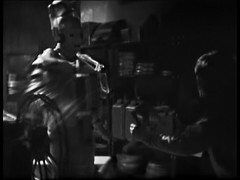 By a process of elimination the Cyberman guarding Ben in the projection room is Shav, played by Gregg Palmer, who plays Gern, the Earth Controller (Cyber controller?) in episode 4. You can see what he looks like because he later appears on-screen as Lieutenant Lucke in episode 3 of The War Games. Unfortunately it's hard to get a good screenshot of him by himself as the projection room is shrouded in darkness, but in the shot of the control room Shav is on the left, Krail is in the middle, and Talon, who is just descended from the stairs, is on the right. 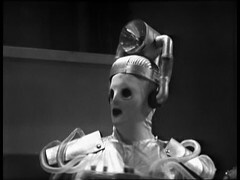 Unlike in later stories the Cybermen's voices are not provided by the actor playing them. Instead voice artist Roy Skelton, who provided Monoid voices in The Ark episode 4: The Bomb, makes his second Doctor Who appearance. IMDB reckons he cameos as a control room technician in the third episode 2, but we shall see. At the end of this season he finally starts work on his most famous Doctor Who role, as the Dalek voice, in The Evil of the Daleks episode 1 before playing the Computer voice in The Ice Warriors and reprising the Cyberman voice in the Wheel in Space, both in the next season. 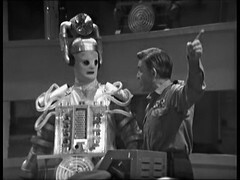 His one appearance in Patrick Troughton's final season as The Krotons' voice in The Krotons after which he doesn't feature again until his first on-screen appearance as Norton in Colony in Space. He's Wester in Planet of the Daleks, invisible until his death when he is briefly seen, a story for which he also provides Dalek voices. He's called back to Doctor Who quickly as an emergency substitute playing James in The Green Death episode five after another actor fell ill. He's the Daleks' voice in Genesis of the Daleks before making two on-screen appearances under makes up as Marshall Chedaki in The Android Invasion and Rokon in The Hand of Fear. He's returns to Dalek voices in Destiny of the Daleks, where he also briefly plays K-9's voice too, before providing Dalek voices in The Five Doctors, Revelation of the Daleks and Remembrance of the Daleks. He's got an Out of the Unknown appearance to his name, providing Robot voices in The Prophet, which is the story who's robot costumes were reused for The Mind Robber and features The Stones of Blood's Beatrix Lehmann as Dr. Susan Calvin. Alas no recording of the episode survives so the only trace of it on the Out of the Unknown DVD Set is a series of off-screen images. Despite this mass of Doctor who work the roles which Skelton is most famous for are the voices of Zippy and George in Rainbow and when interviewed for Doctor who: Cybermen: The Early Years he can't resist signing off as his most famous creations!